Notes about the surrounding area: Gordonville is nothing more than an intersection of two rural roads, a Masonic Lodge and a post office. The area surrounding the campground is nearly all agricultural with many horse and cattle ranches. The nearest town with any appreciable amount of businesses is Whitesboro, TX, which is a 20-minute drive south. Whitesboro has a grocery store, pharmacy, restaurants (local and chain) and several retail stores. The nearest town that passes the “Walmart test” (big enough to have a Walmart) would be either Gainesville, TX or Sherman, TX. Both are nearly 30 minutes away to the southwest and southeast, respectively. Sherman is the larger of the two and has nearly anything you could need or want, but Gainesville is located on I-35. 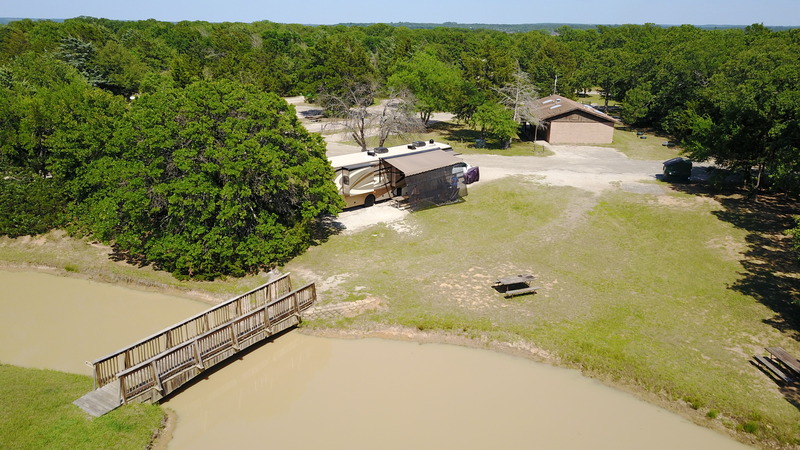 The campground property touches Lake Texoma. Lake Texoma is named as such because it straddles the border of TEXas and OklahOMA (North of Dallas/Fort Worth). It is a good-sized lake and there are multiple marinas and one restaurant, Pelican’s Landing, within a couple miles of the campground. We have not eaten there, but the reviews are decent, it is located on the water and offers nice views. The campground is not far from many other attractions, as the crow flies (such as the humongous Winstar Casino), but with the lake and lack of roadways and bridges, it can take a while to get to any of them. A quick note about gaming at the Winstar, and any other Oklahoma casinos; it is not a “Vegas-like” experience. Table games, such as craps and blackjack, have antes and there is no free booze while gambling. Craps is also played with cards since dice are not allowed. This doesn’t mean it can’t be a fun excursion, but having proper expectations is important. Particular notes about this campground and/or sites: Thousand Trails Lake Texoma is what I would call a “medium” sized campground at 285 sites, according to the website. Most of those are full-hookup with a mix of 50 and 30 amp. There is a wooded portion of the “A” loop which does not have sewer, but nearly everywhere else in the park does. The 50 amp sites do come with a $3/night surcharge for members. There is a solid mix of shaded/wooded and exposed sites throughout the park. There are also eight pull-thru, 30 amp sites. The roadways are average or slightly better than other TT properties. Nearly all sites are gravel and most are in decent to good shape. Like most TT parks, there are a good number of seasonal and annual tenants. Most of these seem to be “second homes” for their owners and they are vacant for the majority of the time, but occupying the site nonetheless. 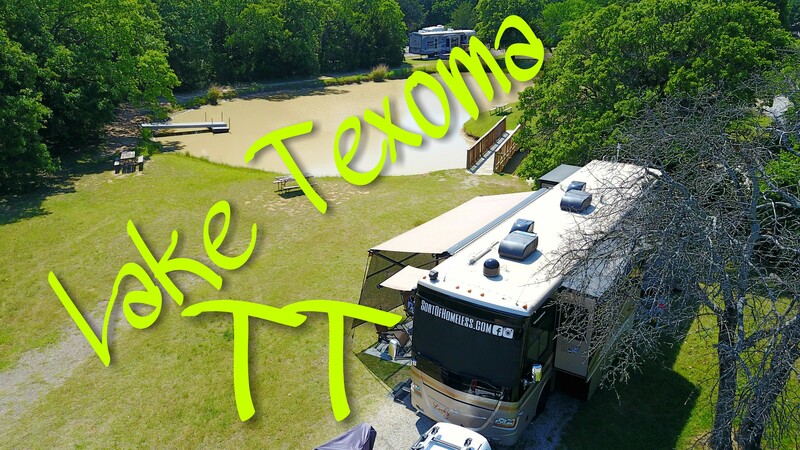 There are no sites on Lake Texoma and it is nearly a mile walk, or drive, from the campground to get to the water. There is a smaller pond in the park which does has several spots overlooking, but some are occupied by annuals and/or cabins. The park does have a small café which, at the time of this writing, is open limited hours on Friday, Saturday and Sunday. This park will ONLY accept packages from FedEx and UPS – NO U.S. Postal! This is the first time we’ve encountered this and it’s a pain. We frequently buy things (probably too frequently) from Amazon using two-day, Prime shipping. Using this service, there is no way to specify the shipping service that will be used. I find you increase your chance of getting something from UPS or FedEx by paying for one-day shipping, but it’s not a guarantee. I also can’t do general delivery to the local post office since they will only accept USPS mail – and again, I can’t specify that method of shipping. This campground does charge $2/package and I fear the reason they don’t allow USPS is because they can’t legally charge this fee on U.S. Postal packages. This is my hunch, but I can’t confirm it. If anyone knows how to trick the Amazon computer system into shipping with a specific carrier, I’m all ears. Amenities: The amenities seem to be in above-average condition for TT. They include two pools (family and adult), adult lodge, family center, café, shuffleboard, horseshoes, “sport court”, mini golf and a playground. There is a “Country Store” that is open Thursday – Sunday, 10:30-5:30 with ice cream, drinks and other random snacks and camping products. WiFi is available around the park and at the family center, but we could not find anywhere where the cost is free. Our experience: This is being written after our second stay here – the first was a year ago. We originally didn’t have plans to be back this year, but when plans changed it made logistical sense to visit Lake Texoma again. 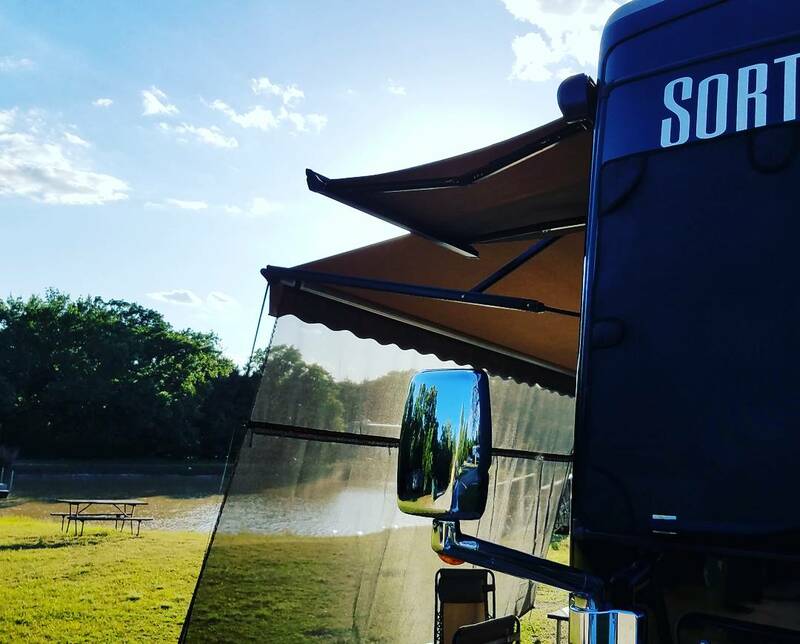 Our stays once again prove how much influence the weather and site availability will have an impact on your overall campground experience. Our first stay was fine – nothing outstanding (besides being able to hang out with RV Love again), but definitely nothing bad either. We got a nice 30 amp site in the “C” section, along a tree line where I had easy satellite access from the roof. The weather, however, was not as friendly and we ended up leaving a day early to get ahead of incoming storms. That stay was in mid-April and it seemed quite busy – not packed, but busy. Our second, and current, stay is definitely different. It is early May and it’s much less busy – way less than 50% capacity. I’m not sure if that’s the difference a couple weeks make or if this year has had lower numbers in general. I do know that last year we were forced to come here after flooding affected campgrounds further south, so that could have something to do with it. We were able to get a spot (A7) directly on the pond with absolutely nobody on our patio side, across the street from a bathhouse and near, but not right next to a dumpster – definitely a premium site! It’s not 50 amp, but that just saves me $3/day for minimal inconvenience. The weather has also been very nice during our stay and we’ve been able to enjoy sitting on the patio and listening to the fountain splash on the pond in the background. The staff has been helpful and when our electric went out at 2:00 AM on our first night (why wouldn’t it be 2AM!? ), they came right out after we called them the next morning to swap the breaker, which fixed the problem. The nice spot we found did have some low-hanging limbs from a dead tree that were an issue. I was able to back in partially, jump on the roof and do some manual pruning by-hand to remedy the problem. I hope they soon eliminate the tree altogether so it’s not a potential hazard to any of the surrounding rigs. SOH Score (1-10, 10 being the best campground imaginable): 6 – This stay has been great and we’ve thoroughly enjoyed this site. It would be nice if there were more restaurants and businesses nearby, but that’s how it is. The “no USPS” policy probably cost them a half point since it’s such a problem for our lifestyle. I would rank this park as better-than-most in many categories for TT campgrounds. Sounds like you two had an enjoyable time. Hope all is well.